The REP’s big Christmas show this year is David Wood’s adaptation of a Roald Dahl novel – not one of his strongest but containing the quintessential elements of a Dahl classic nevertheless: horrible villains, a downtrodden but virtuous child protagonist, nonsensical words, and some scary moments. Director Teresa Ludovico throws everything at the stage in the first act to bring Giant Country to life, with music, movement, masks and mime… There are circus skills and gigantic legs and hands – it’s like a bonkers Italian variety show rather the traditional fare and it works! Especially in the transmission of the darkness and horror that runs through Dahl’s slender tale. Lara Wollington (a former Matilda) is excellent as perky orphan Sophie. Abducted by a giant (in a terrifying sequence) she soon befriends him and he reveals he’s not like other giants in that he refuses to eat the flesh of human children. Weirdo. Shunned by his peers, he faces the type of scorn and derision usually doled out to Vegans by meat-eating brutes. Wollington is nothing short of perfect in the role. She has a strong, clear and expressive voice, bags of energy and performs the quirky, jerky, sometimes balletic, movements with ease and ability. In his Frankenstein footwear and waistcoat this Big Friendly Giant looks like a lecturer from Middle Earth Polytechnic but Joshua Manning fulfils this tall order superbly well, making the titular character a likeable sort and managing the mangled language with ease. He may not be all that B of a G but he is certainly F. With the aid of sound effects and the clever use of perspective, he stomps around, leading his new little friend through a series of moments, each of them beautifully staged by a talented and versatile ensemble, who will backflip as soon as look at you. It’s all gloriously theatrical, a cavalcade of the performing arts, and carried off with such brio you are willing to overlook the fact that it’s largely padding to eke out the story until the interval. In the second act we move from Giant Country to Buckingham Palace and the bedroom of Her Majesty the Queen of England. Here, Sophie does a Michael Fagan, breaking in to warn Her Maj of impending giant-sized disaster. Mike Goodenough’s Queen may resemble Benny Hill more than that lady off of the postage stamps but he’s more than good enough – a restrained panto dame who gets the funniest lines, which he delivers with pouting relish. The other giants are left (largely) to the imagination and this makes them all the scarier.. Huge shadows are thrown across the backdrop and sometimes hands and feet appear. It’s what we don’t see that scares us and talk of bones found outside an orphanage is particularly gruesome. Hats off to the technical team. Set and costume designer Robert Innes Hopkins, along with lighting by Peter Mumford, gives the piece a dreamscape quality, with mists and shadows contrasted with bursts of vibrant colour. Frank Moon and Martin Riley’s unconventional score is played live under the musical direction of Riley himself on keyboards. Percussionist Tom Chapman and guitarist Tom Durham are accompanied at various points by cast members on a range of instruments. It all adds to the atmosphere and above all the fun. Stylish and surreal, this BFG is an enjoyable alternative to the usual pantomimes on offer, a theatrical banquet with plenty to satisfy everyone. 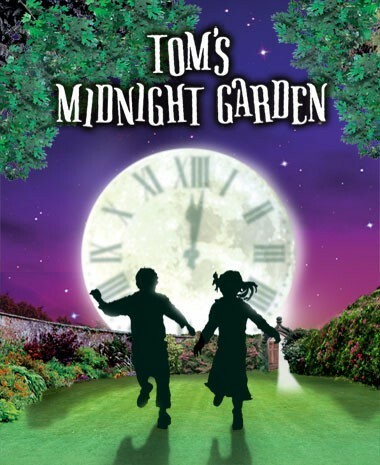 David Wood’s adaptation of Michelle Magorian’s classic children’s novel is a spell-binding piece of theatre that tugs at the heartstrings without descending into mawkish sentimentality. Director Angus Jackson tells the tale naturalistically but in a stylised setting. Scenery is sparse – for the Dorset scenes, there is little more than a raised platform with the odd doorway and items of furniture –this platform also serves as the stage for the amdram productions the children enjoy. For the London scenes in the second half, the platform lifts up to become the oppressive dinginess of the slum home little Willy shares with his religious crackpot mother. The action flows from place to place as easy as turning pages in a storybook. The plot concerns the evacuation of children to the countryside just before the outbreak of the Second World War, back in the days when strangers were trusted as a matter of course with nary a whiff of a CRB check. And so, weedy urchin William (Arthur Gledhill-Franks) is placed with grizzled old curmudgeon Mister Tom (Oliver Ford Davies) and a relationship develops between the two that, through the course of the action, heals the wounds they both suffered before they met. The boy has livid bruises from his mother’s belt. The old man has been a recluse for decades since his wife died giving birth to a son that also didn’t survive. 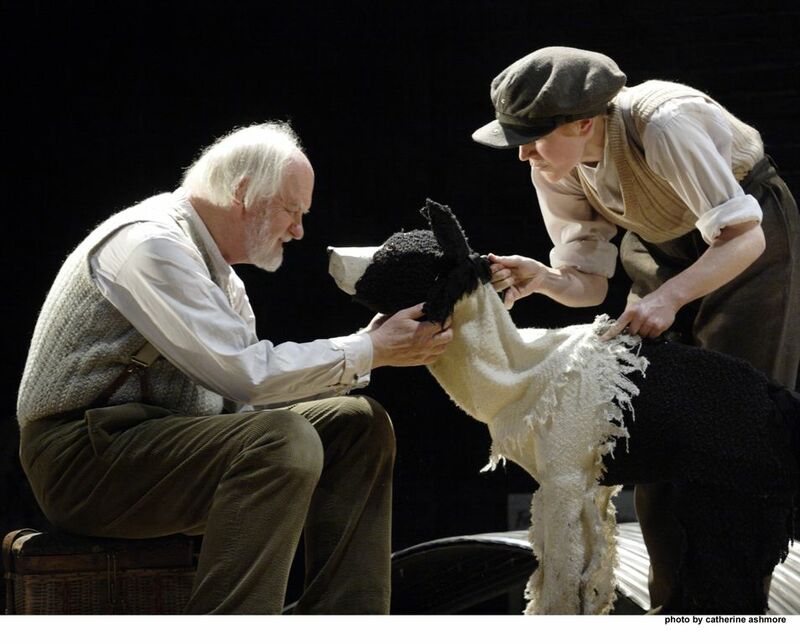 It’s a very touching story and an utterly charming production. This reviewer confesses to having to wipe his eyes several times throughout the evening. The ensemble, doubling on adult and child roles in places (in a Blue Remembered Hills kind of way) keep the action going, creating atmosphere and character quickly and economically. A standout is Joseph Holgate as theatrical extrovert Zach who helps bring Will out of his shell, and also Aoife McMahon as the villain of the piece (not counting the offstage Hitler, of course) who berates and beats her ‘Willy’ in the guise of religious correction. She is a Catherine Tate monster, an East End version of the mother in Carrie but a tragic figure nevertheless. Oliver Ford Davies’s Tom Oakley is a likeable old grump, even-tempered and guarded. His thaw is glacial, and his matter-of-factness is all the more touching. As William, Arthur Gledhill Franks is almost unbearably vulnerable. His growth into a confident and affectionate member of the community, after some of the most horrific abuse imaginable, is a delight to behold. There is a real danger that the puppets might upstage the actors. Beautiful birds, a twitchy squirrel and above all, a wonderful Border Collie, add to the storybook feel but they are also played absolutely straight. You soon forget operator Elisa de Grey’s continual presence behind Sammy the dog and instantly fall in love with the animal itself. Somehow the balance is maintained and the puppets enhance the performance rather than stealing the show. My hat is off to puppet master Toby Olié for his wonderful creations. This is a perfect piece of theatre for all the family. Nothing is sugar-coated but somehow it manages to be very sweet indeed. A man approaches a trunk in a ruined space that suggests an attic. He opens the trunk and takes out a diary. Suddenly the stage is flooded with ghosts in Edwardian dress. “Remember” they chant. A small boy – his younger self- clambers from the trunk. We are propelled back fifty years in the man’s memory to meet these ghosts when they were alive and when he, as a 12 year old, went to stay at their country house for one idyllic summer. So begins David Wood’s new musical adaptation of the classic novel. Which I haven’t read. Neither have I seen the Joseph Losey film. So I was able to approach the story without preconceptions. This is not one of those musicals where you can sing along. It’s one of those sung-through things but, thankfully devoid of the endless reprises so favoured by Andrew Lloyd Webber in his later works. This is more of a Stephen Sondheim kind of affair, heavy on recitative, with only a few melodic passages that veer towards what you might call actual songs. That in itself is not a problem. In fact, Richard Taylor’s score spills out of the onstage piano like a stream of consciousness, its moods mercurial and peppered with leitmotifs. The cast are almost all on stage the whole time. Using the chest I mentioned before, some semi-pellucid chairs and the occasional branch or coat hanger, the actors create the necessary changes of scene in an emblematic way. The older Leo stalks his younger self, like a shadow, reliving the incidents from his childhood. This is a device I’ve seen before – in a recent touring production of To Kill A Mockingbird – but here it has more impact. Young Leo becomes an intermediary between young lady of the manor, Marian, and Ted, the burly farmer from across the river. He passes love notes between them, without fully knowing what is going on, but gradually he puts two and two together and comes up with three. It is only in hindsight that the middle-aged Leo can add it all up. It wasn’t clear to me what he’d been doing for fifty years. “I withdrew into myself” he says; the younger him complains, “You let me down,” and they have a bit of a slanging match, but I’d still like to know how he spent his life. The cast works as a true ensemble. As old Leo, James Staddon is able to belt when he needs to while bringing a tenderness and vulnerability to the character. As a memory play, it is certainly more effective than that abysmal Travesties I went a few weeks ago. Michael Pavelka’s off-kilter set reflects the skewiff nature of Old Leo’s mental state, and the proceedings are beautifully lit by Tim Lutkin. Unfortunately, for me at any rate, it was a triumph of style over substance. I was too caught up in director Roger Haines’s clever ideas and the style of the presentation to be moved by the fate of the protagonists.